Now that HAL has really ended its shelf live what to people turn to, well I see a lot of people assuming that EPMA must be the answer and end up wishing they have never taken that route. If you load hierarchies from files or manage them straight from a repository then ODI (Oracle Data Integrator) could be the way you want to go, it offers all this functionality and so much more. ODI sits in Oracle fusion middleware suite of products and basically it’s an Extract Load and Transform (E-LT) tool, it used to be owned by Sunopsis until it swallowed by the hungry jaws of Oracle. It has built in connectivity to all the major databases and now has the added bonus of Essbase and Planning adaptors which can be plugged straight into it. ODI includes something known as Knowledge Modules that are components, which contain the information for ODI to perform a specific set of tasks against a specific technology such as Planning. There are 6 different types of KMs and some have already been created for use with planning and essbase. • RKM (Reverse Knowledge Modules) are used to perform a customized reverse-engineering of data models for a specific technology. tables and other systems (files, middleware, mainframe, etc.). • IKM (Integration Knowledge Modules) are used to integrate (load) data to the target tables. Updated 26/10/08 - I suggest installing ODI Version 10.1.3.4.5 or above, this will have all the latest updated KMs and includes all neccessary drivers, if you install the patch you will not need the Planning/Essbase ODI Installation files. As ODI 11g is the last version then it is worth downloading and installing unless it is a requirement you need to use ODI 10g. I have set up ODI against a 9.3.1 environment before but this time I am going to put it against a 11 environment, the setup shouldn’t be any different though I am hoping adapter files will still work as I have not seen any for 11 yet. 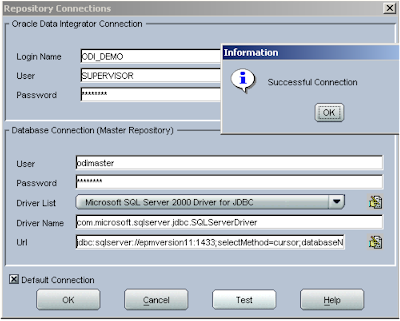 If you are using SQL server as I am for the database repository then you will also need JDBC drivers, I am going to use the 2005 drivers, which can easily be downloaded from Microsoft. The installation of ODI is very simple just double click the setup.bat inside the \setup\Windows\ directory; you will be warned if your machine does not pass the pre-requisites. Once in the product selection choose “Oracle Data Integrator 10.1.3.4.0”, choose complete which just means the client and the server will be installed and select the ODI home and that’s pretty much it. Repeat for Planning, some of the files will already exist so just keep the latest ones. To use ODI you will need to create two database repositories these are known as the Master Repository and the Work Repository. The Work holds all the information on data models, projects and how they are used. If you are using Oracle grant schema user connect and resource, for SQL server I just made them dbo. Once the databases have been created you can create the ODI master repository. Now because I am using sql server 2005 I had to manually enter driver and url string as ODI only includes preset values for sql server 2000. If you are using Oracle you can easily select Driver and just update the URL. When you start up the topology manager you have to connect to a Master Repository, unfortunately this is more manual work entering all the JDBC details again. Click the new button when the security repository connection window opens. OK we are in and the first thing we need to set up is the work repository and you guessed it yet more entering of the connection details. 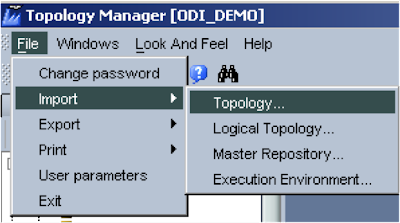 There is a tab at the bottom of the topology manager with “AB” on it that means repositories. 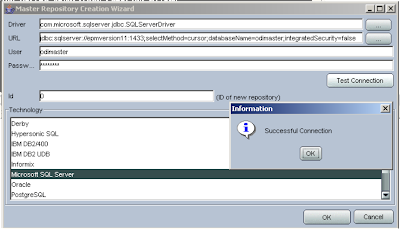 Insert a new work repository and enter all the details in the definition and JDBC tabbed window. When you click test you will be asked to pick an agent, you can just choose Local (No Agent) for now, details on agents shortly. You will then be asked for a name for the work repository and an id, the id can be any numeric value, I have always left the Type as development the other option is Execution. In the topology manager the Hyperion Essbase technology has already been included but the planning needs adding in. Go to the first tab and choose to import topology. 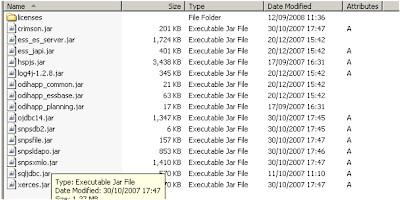 Locate the impexp folder of the planning installation files. All being well Hyperion Planning should then appear in the technologies list. Well that is it for this session as I said I want to try and break it up into lots of bite size chunks instead of one endless blog. Next session will be setting up of the agent and then configuring some of the technologies such as planning. I have 10.1.3.2.0 installed and I have run the upgrade to 10.1.3.5.0. The installation reported no errors. I still only see Hyperion Essbase in the Topology Manager. How do I get Planning Installed. I have read your instructions but I am still missing something. When do I get or find the Planning Adapter. How about a web link if you have it? nice article, can't hardly wait for part 2. if you could gave article to more specific in ODI web service and data transformation. nice work, really appreciate it. 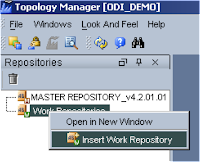 I have Installed ODI and trying to create Master Repository, but stuck in the middle. 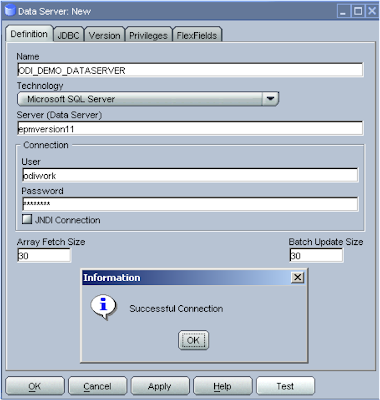 ""If you are using Oracle grant schema user connect and resource, for SQL server I just made them dbo."" You have mentioned to create two database tables in Sql Server. how do you integrate them..
Can you please describe me in detail. Was struggling. Will try this out asap. Type of Work Repository (Development/Execution) defines possibility of connection by ODI Designer to this repository. If it is Execution, it will be impossible to be connected.